I was searching for zucchini recipes and found this one in Food Network’s site. It’s by Paula Deen. 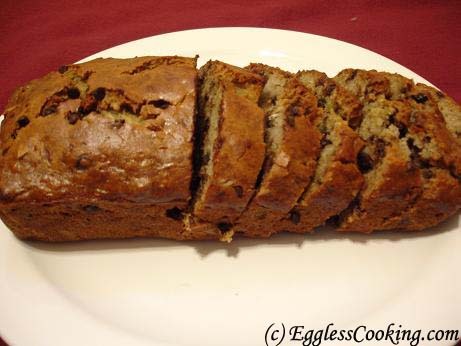 The original recipe yields 2 loaves, so I scaled down the ingredients to 50% to bake 1 loaf and used bananas to make it eggless. Wondering what to do with zucchini? 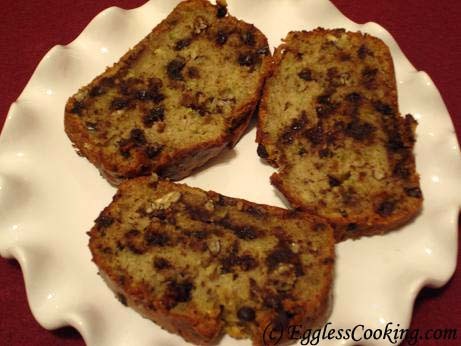 How about this moist and flavorful banana chocolate quick bread! Pre-heat the oven at 350F/180C for 15 minutes. Combine ingredients in Part 1 and sieve them. To this add the ingredients in Part 2. 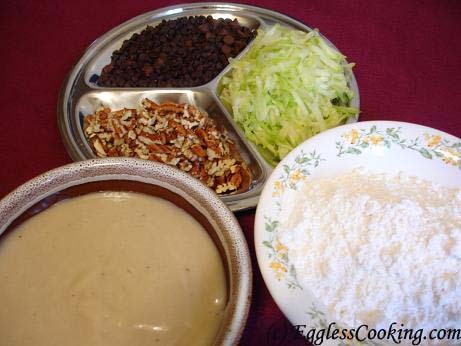 Combine ingredients in Part 3 in a blender/or cream it using an electric hand mixer. I used my magic bullet blender to blend it. Add this mixture to the above dry ingredients and mix it well. You may add a little milk, if you feel that the mixture requires some more liquid. I had to add a couple of tablespoons of milk because I increased the quantity of zucchini. Pour it in a greased bread loaf pan. Bake it at 350F for 50 min or until a skewer inserted in the middle of the loaf comes out clean. Cool the bread in the pan for 30 minutes before transferring it to a wire rack. Wait for another 30-45 minutes before slicing the bread. 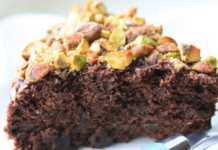 This is similar to the carrot cake recipe, but uses zucchini and chocolate chips instead. Next time I will add both carrots and zucchinis. I feel that the Magic Bullet Blender is very versatile. I bought it 2 years back to puree steamed vegetables and fruits in small quantities for my infant son. But it does a lot more. The recipe booklet which comes along with the blender is also very useful. I have made muffins and soups as mentioned in the recipe book and it has come out very well also. Even in the above recipe I add all the ingredients in Part 3 in the blenders big jar and gave it a few pulses and it’s ready within few minutes. I find it more easy than using an electric hand mixer. 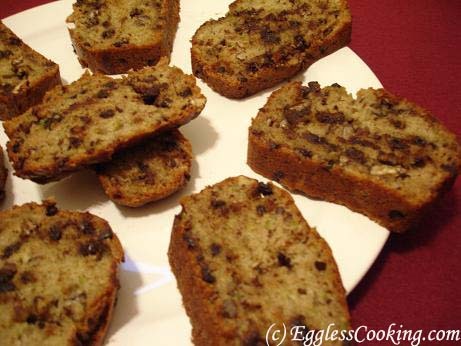 Use Vegan chocolate chips/carob chips to make this bread 100% vegan. Delicious! These were moist ( I hate this word;) and a nice density (not too airy and not too heavy). This is an awesome recipe for no eggs. I made some revisions due to available ingredients and preference. I substituted a little less than 1/2 c of maple syrup, instead of white sugar. I used 3/4 c of whole wheat flour and 3/4 c of white flour. That’s all I had. Instead of vegetable oil, I used 1/4 c apple (unsweetened) sauce and 1/4 c of coconut oil and 1 banana. I made regular muffins (5) ( no chocolate for my daughter) and mini (20) (chocolate for the rest of us chocolate hounds). I was surprised by how many it yielded. I will definitely make these again. Thank you! Wow! That’s a lot of revisions and great to know that it turned out good even after that. Thanks for the feedback Kerry. I would like to try this recipe. Can I replace zucchini with cucumber or any other vegetable? Cucumber a big no. It has a distinct flavor and it wouldn’t taste good in a cake. You can use carrots or beets. What size bananas? About 1/2 to 3/4 cup? Great Liz! Thanks for the feedback. 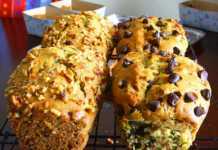 I made the Banana Zucchini Bread and my kids (1 & 3) loved it. My 3 year old who is an extremely picky eater loved it, we just don’t talk about the zucchini being in it (shhhhhh). We will make this again. I made 2 loaves and froze one, it freezes really nice. Thank you for the great recipe. You are very welcome Norah. I’m very glad that your kids liked it. Awesome recipe! Thanks so much for sharing it! Lately I bake this almost every alternate week as Banana cake which makes both kids happy and mom happy(I don’t utter the “Z” word or they will not come near it!)! came out good. I used condensed milk instead of banana, not a big fan of that. I tried removing it from the pan after 15 mins and that broke the bread. I should have waited for 30 mins?? That’s a nice idea to use condensed milk. The bread should cool completely. I would suggest even leaving it overnight. 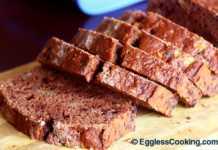 15 minutes is too soon for quick bread especially. 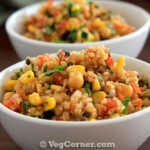 posted about it on my blog and thanked you for the recipe too. Thanks again for this – you know I love your site and come here often. My mom is visiting and she does not eat eggs and egg products. Your site is a boon for me when I want to bake something for her! Thanks! You’re welcome Anu. I’ll check it out. Thanks, I will give it a try with milk as a substitute! I love this recipe and want to really try it. I am not a big fan of banana, can you please suggest a replacement for the 2 bananas? You could use 1/2 to 3/4th cup (depending upon the consistency of the batter) unsweetened applesauce instead and increase the quantity of sugar to 1 cup because the applesauce will not be sweet like bananas. Thanks for the tip about using Apple Sauce. Sorry for being picky, any other replacement? Don’t be sorry Meghana. 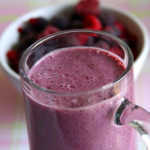 You could use any pureed fruit or try plain milk. If you are using milk, add it little by little until you get the desired consistency. 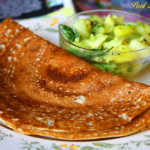 Thank You, Madhuram for the recipe. I want to try this out, but is there any substitution to the bananas? As I personally don’t like bananas! Hi Shilpi, check below my reply for Meghana. I just made this for my egg-allergic baby as a snack. 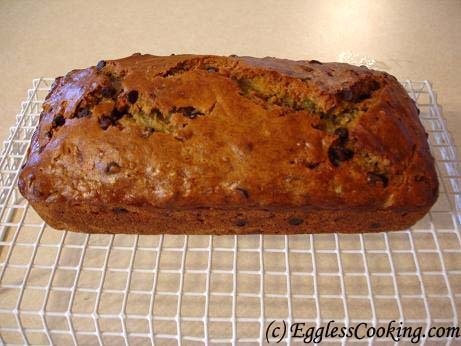 I used chopped almonds instead of walnuts, no chocolate chips and doubled the recipes to freeze one loaf. IT WAS AMAZING!!! I used almost 4 cups of zucchini (we had a plethora)! Thanks for the website! You’re welcome Sarah. I too have to try freezing quick breads and muffins. Thank you, Thank you and Thank you, I baked this with my friend today without chocolate chips and it came out so good. I keep the banans in in a brown bag and leave it in pantry for few days. The skin shoukld be almost black and when you peel thay are not pelasant looking some times. 3 bananas + 3/4 cup brown sugar mash very well. Add 1/2 cup walnuts and 1/4 cup resins I used golden. 1 and 3/4 cup whole wheat flour. Two- three table spoon organic flex meal. 1/2 teaspoon baking soda and 1/2 tea spoon baking powder. 2 table spoon yogurt. 3-4 teaspoon olive oil. and baked in a greased pyrex bread pan at 335 for 20-25 minutes. toward the end i brushed 1 teasp of olive oil. Left in oven to cool for 15 more minutes. After cooling cut in slices and enjoy with icecream topping. That’s one healthy loaf of bread Bindu. Thanks for sharing the recipe. I’m sorry about the delayed reply. I’m just back from my vacation. 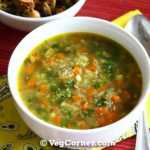 You can simply omit the carrots/zucchini and keep the quantity of banana the same. I think it would bake a couple minutes earlier, so do the toothpick test a couple of minutes before the time mentioned in the recipe. I dont find zucchini in india. Can I skip it? Yes, you can use grated carrots instead.